Why don’t we vote on weekends? French expatriates lined up at the International School of Boston to vote for the country’s president. Although voter turnout in the French presidential election Sunday was lower than usual, it was still well above most US elections — fueling a long-running debate about whether American elections should be held on weekends in an effort to make voting easier and more convenient. The United States trails most developed countries in voter participation, according to the Pew Research Center, and many countries that vote on weekends see voters casting ballots in greater number. 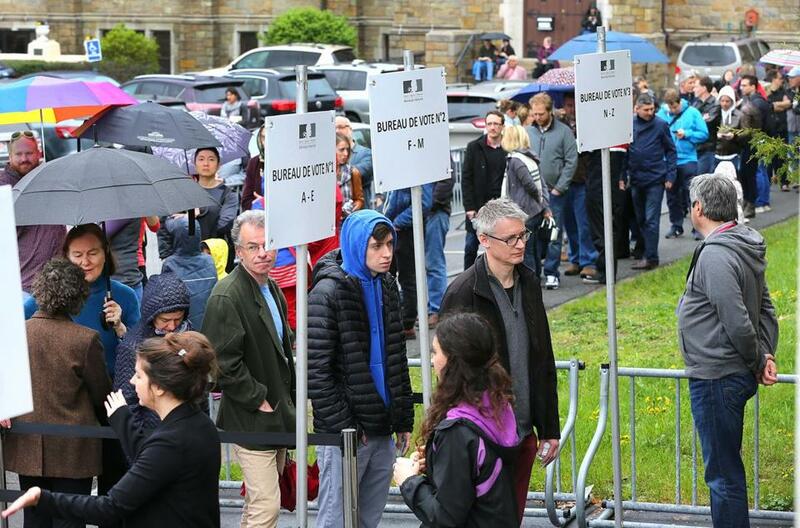 “Voting Sundays are always a popular day — you can feel it when you walk in the street,” said Vincent Pons, a Harvard Business School professor, who is French. Supporters of weekend elections say Americans would also vote in greater numbers if they didn’t have to wait in lines at polling places before or after work and worry about child care, rush-hour traffic, and other workday pressures. A political outsider is going to become the next president of France. It’s only a question of which outsider. The goal would be to “make voting a pleasant experience as opposed to a pain,” said Norman J. Ornstein, a resident scholar at the American Enterprise Institute and cofounder of “Why Tuesday?” a nonprofit group that advocates for weekend voting. But others question whether Americans are really shunning their polling places because it’s inconvenient. About 65 percent of French voters headed to the polls Sunday, handing the centrist candidate Emmanuel Macron a victory over his far-right opponent, Marine Le Pen. In recent years, more than 70 percent of France’s voting-age population has cast ballots in presidential elections, compared with about 55 percent in American presidential elections. Mark Franklin, a professor emeritus of international politics at Trinity College in Hartford, said the biggest problem with US turnout is that political campaigns do not speak to the concerns of most Americans, 35 percent of whom are not even registered to vote. “Evidence is, that if people were motivated, and they thought their votes would matter, then they would register,” Franklin said. In any case, Congress has never shown much interest in abandoning the country’s long tradition of Tuesday voting, which has been enshrined in federal law since 1845. Back then, Tuesdays were thought to be convenient because voting on Monday would have required Americans to begin trekking to polling places on Sunday, the Sabbath. And Wednesday was ruled out because it was market day for farmers. Of course, that logic has “nothing to do with modern life or lifestyles,” Ornstein said. Since 1995, some members of Congress have fought to move federal elections to the weekend. This year, the bill has 49 sponsors, all Democrats, including Representatives Joseph P. Kennedy III and James P. McGovern of Massachusetts. Republicans have spurned the legislation, Ornstein said, because they believe that weekend voting would draw more urban voters and minorities to the polls to vote for Democrats. “In our tribal environment, you have one party that doesn’t want to increase turnout,” he said. Some Republicans scoff at the notion that a day change would address the complex challenge of voter apathy. Some political scientists say there is scant evidence to suggest that weekend voting, though it seems logical, increases turnout. “Most of the research seems to suggest no, but exactly why there is no effect is not quite clear,” said André Blais, a professor at the Université de Montréal, who studies voter behavior and electoral systems in 50 countries. Others who question the benefits of weekend voting point out that most Americans who are registered to vote cast ballots. In the 2012 presidential election, for example, turnout among registered voters in the nation was 84 percent, according to Pew. But the United States, unlike many countries with higher turnout, requires citizens to register to vote ahead of time. Only about 65 percent of voting-age Americans were registered in 2012, according to Pew. Therefore, simply making it easier for Americans to register might do more to drive up turnout than moving elections to the weekend. Massachusetts, for its part, has already embraced some weekend voting under a 2014 state law that allowed polling places to open 11 business days before an election, beginning with last year’s presidential election. In November, more than 1 million people, or about 21 percent of the electorate, cast ballots in that early period, and the weekend vote was brisk and “largely successful,” Galvin said. But he said the strong turnout was driven not by the extended voting period but by the fierce fight between Hillary Clinton and Donald Trump and the ballot questions involv- ing marijuana and charter schools. Franklin, the Trinity professor, pointed out that many countries ensure high turnout by making voting compulsory. Australia, for example, fines citizens $15 if they don’t vote, and turnout there is about 91 percent.